According to the latest leaks, rumors and information provided to wccftech the GeForce GTX 1170 is powered by a 104 class GPU, codenamed GT104 that measures around ~400mm². The GTX 1170 would have around 2688 CUDA cores, a 256-bit GDDR6 memory interface and 8 to 16 gigabytes of 12Gbps GDDR6 memory, which is slightly slower memory than the GTX 1180. The graphics card is expected to have a core clock of around ~1.5GHz and a boost clock of around ~1.8GHz. The TDP of this graphics card is unconfirmed to date, but is expected to be somewhere between 140-160W. Peak FP32 compute performance is expected to be around 9.75 TFLOPS, depending on how high of a clock speed the graphics card will be able to hit and how often. 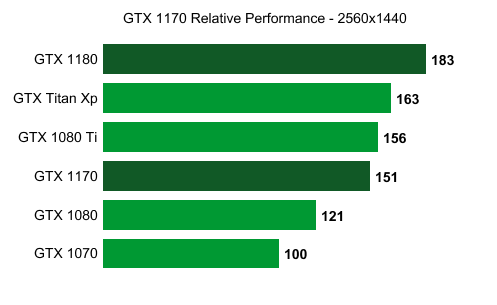 This puts it in the same league of NVIDIA’s existing GeForce GTX 1080 Ti. So you can expect around GTX 1080 Ti performance or slightly better with aftermarket models, but at significantly lower power consumption. Pricing and the release date are the most fluid parts of a product launch, so this could definitely change. But, you can expect the GeForce GTX 1170 to be released in the summer. All leaks and rumors point to a debut around the GTX 1180 at around July, so you can expect the GTX 1170 to be available on shelves at the same time or a couple of weeks later in August. In terms of pricing, whispers say that NVIDIA is looking to charge more for the GTX 1170 as compared to the GTX 1070, with some sources quoted as saying to expect a price tag of around $499. I need money to buy this and a 120HZ monitor. These days they are way to overprized because of mining. that will not change anytime soon. Contradicting yourself. You don't need one since you can't see the difference. Average gamer can't tell the difference without experience. I can't tell the difference between 60Hz and 120Hz. I am not a pro gamer. I am a casual gamer. My eyes are not bad, so don't tell me I need to get my eyes check up because I can't tell the difference between 60Hz and 120HZ. Non-gamers have TVs with higher refresh rates, so you sure it's not worth it? Because I don't have a 120Hz refresh rate monitor that I can test it out side by side with my 60Hz monitor. I can tell at the desktop with a black wallpaper, I can see the difference when the mouse moves, but in the game is kinda hard because I don't have a 120HZ refresh rate monitor to test it out live. It wouldn't be bad to buy one and return it back if I don't like it. Sitting behind a PC monitor is very last decade. I have a full body suit simulation with VR headset, rumble and moving floor panels. Oh and Dolby Atmos in a sound-proof room. Boy, stop show off. I am here struggled to get me a GTX 1070 upgrade from GTX 970 because the price keeps skyrocketing due to miners. I hope this new GTX 11 series will drop the GTX 10 series down A LOT. Holy crap. This company man. How the hell do they do it? What can they not do? They already have access to peoples' wallets, what more do they need?